In the Ukraine conflict, many have scoured the military equipment sightings on social media to find evidence of Russian involvement. One obvious sign to look for is equipment that’s either exclusively used by Armed Forces of the Russian Federation, or has not ever been in manufactured or service in Ukraine. The modernized T-72B3 main battle tank has been an example of military equipment that is out of place in a conflict where Russian government actively denies military involvement. In this post, we will look at some of the unique characteristics of the T-72B3 which are useful when attempting to identify it from footage posted online. Since the focus here is on visual identification, we will not look at all the minute details and internal differences between various models. The latest variant in the T-72B family, deliveries of the T-72B3 to Russian armed forces started in 2012, with 270 tanks delivered in 2013, and deliveries continuing to this day. In April 2014, IISS research analyst Jopeph Dempsey noted the presence of T-72B3 tanks near the Ukrainian border. One of the eye-catching features of the T-72B3 are the sharp wedge-shaped elements on the tank’s turret. These are explosive reactive armor (ERA) elements, which are intended to protect the vehicle from armor-piercing effects of anti-tank munitions. The specific type of ERA used on the T-72B3 is called ‘Kontakt-5‘. Update, April 2017: In March 2016, Izvestia reported that a modernization program by Uralvagonzavod for T-72B3’s is underway, featuring a new panoramic commander’s sight and upgrade to newer Relikt ERA. The full modernization bears the name T-72B3M, and one was seen taking part in the 2016 Tank Biathlon at Alabino. A pronounced new identification feature of this variant is the large panoramic commander’s sight installed on top of the turret. However, in March 2017 a Reuters video clip showed newly upgraded T-72B3 tanks without the new commander’s sight, but featuring protection extending further down the side of the tank. The new side protection bears a striking similarity to Relikt ERA that is installed on the T-90MS, another Uralvagonzavod product. But now, back to pre-modernized T-72B3. Let’s have a look at two tanks commonly seen in footage from the Ukraine conflict, and how the ERA elements are arranged on them. We’ll also find that Kontakt-5 ERA is not used exclusively on the B3 variant of T-72. Two tanks commonly seen during the Ukraine conflict: T-64BV and T-72B obr.1989g. Both of these tanks have wedged ERA configuration on the turret. The T-64BV has several features that can be used to distinguish it from the T-72B3; for instance, they use a different chassis altogether, and the T-64BV uses ERA element blocks. The T-72B obr.1989g however warrants a closer look, as it also uses Kontakt-5 ERA elements. In the B3 variant, the ERA elements are fitted on both sides of the main gun, while in T-72B variants sporting Kontakt-5 (like obr. 1989g) there’s an infrared searchlight mounted on the left side of the main gun. For an illustration, see item 1) on the picture below. Main differences on turret between T-72B3 and T-72B obr.1989g: 1) presence of IR searchlight; 2) type of gunner’s sight system; 3) presence of wind sensor. Other visible differences on the turret are 2) the type and profile of the gunner’s sight, and 3) presence of the wind sensor. The T-72B obr.1989g does not have the wind sensor installed on the turret, but to make things more complicated, the later model T-72BA does. Thus, the wind sensor is a helpful indicator, but again can’t alone be used to make a positive ID. 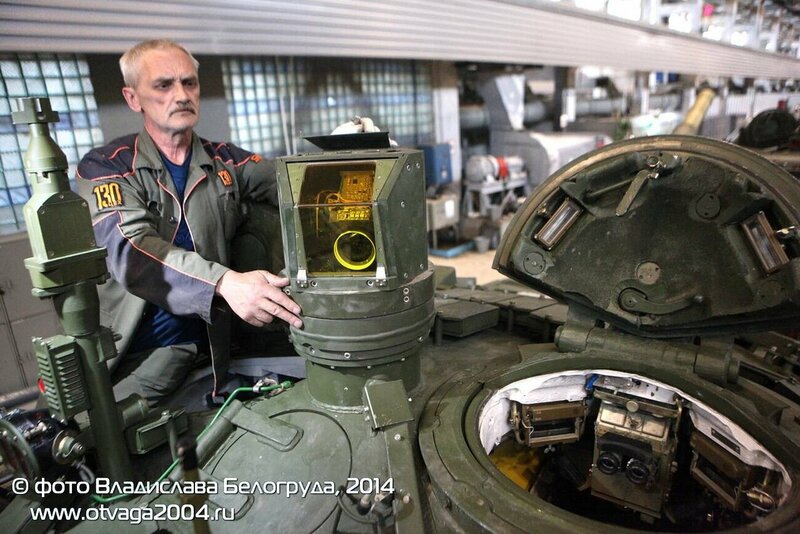 The T-72BA does however retain the IR searchlight. As for the sights, let’s take a closer look. Comparison of equipment on turret: 1) wind sensor; 2) 1A40-1 primary sight; 3) Sosna-U system sight; 4) 1K13-49 system sight. For comparison here we’ll use the T-72BA on the right, and the T-72B3 on the left. The Sosna-U sight system, item 3) above, has a profile that’s a fair bit larger than that of the 1K13-49 system, item 4), that is installed on T-72BA. The difference is big enough that the Sosna-U clearly sticks out from the turret, compared to the earlier sight systems. Thus, it’s possible to visually differentiate between the two. As a final bit, though in practice often tricky, tracks of the tank can also exclude some possibilities. The T-72BA and T-72B3 both share the ‘parallel-hinge’ track design, while the T-72B obr.1989g uses a different pattern. In an interesting development, the T-72B3 upgrade contractor UKBTM demonstrated on a new track design at the MILEX-2014 exhibition, though it’s not know that this design would have been adopted by the armed forces. Update, June 2017: An article about upgraded T-72B3s delivered to Belarus show the tanks equipped with the new tracks. Having looked at the T-72B3 in detail, we can also examine two Ukrainian tank variants with some similar elements. Two Ukrainian tank variants with angled ERA elements on the turret. The T-64B1M’s general shape bears some resemblance to the T-72B3, but that’s where the similarities end. Again, we’re looking at the T-64 chassis, and the turret is not covered with the same wedge elements as the later T-72B variants. The smoke grenade launcher configuration and sights are different, and there is no wind sensor installed. The T-72UMG however looks a bit more like it’s Russian cousin, the T-72B3, but ERA configuration is notably different – the panels are installed on the turret at an angle, but it does not have the protruding Kontakt-5 wedges. So, in summary: given source material that exposes the key areas of the tank, there are a combination of characteristics visible on the exterior T-72B3, which make it possible to positively identify it, and to exclude other possibilities. The video above is included as part of the Bellingcat Ukraine Conflict Vehicle Tracking Project, a crowd sourced project aimed at collecting and organizing images of military vehicles involved in the conflict with Ukraine. Atlantic Council’s “Hiding in Plain Sight” report examines this and other open source evidence of Russia’s military involvement with the war in Ukraine. Veli-Pekka is a doctoral student at Finnish National Defence University, researching social media and open source intelligence. He has a long background in the technology industry, more recently focusing on defense research. of course robert johnson is the actual proof of trolls employed by ukraine and or the west to pose as russians. So much sillyness on his part publishing pics with the wrong tanks, so much promptness by “truth loving free people willing to do their part to unmask the evil plot of the KGB”. You all work for Finkelstein, and I’m sure I don’t need to tell who that is. I could just be a naturally stupid Westerner as opposed to a clever Russian posing as a stupid Westerner or a clever Westerner posing as a stupid Russian? Standard size load is a load that does not exceed design limits of open rolling-stock (platforms, open wagons, transporters), when the wagon is on a straight horizontal section of the railway track (and similarities in the same vertical plane longitudinal axes of the rolling stock and railway track). Oversized freight is a freight that exceeds clearance height of the open rolling-stock, which is on a straight horizontal section of the railway track (and similarities in the same vertical plane longitudinal axes of the rolling stock and railway track). Also there is an additional combined side and top oversize area at a height from 4,000 to 4603 mm at a distance from the railway track 1625 mm to the border zones of top oversize. top oversize area – three degrees. In accordance with the established oversize cargo areas, the cargo may be low, side and top extra-oversized. When the height of the oversize cargo is over 5300 mm – it is called vertical. 5th digit — vertical oversize. Oversize in any area is specified by figure “8”. What is your point here? White dots are used by Ukrainian forces not Russian. What are you talking about?? 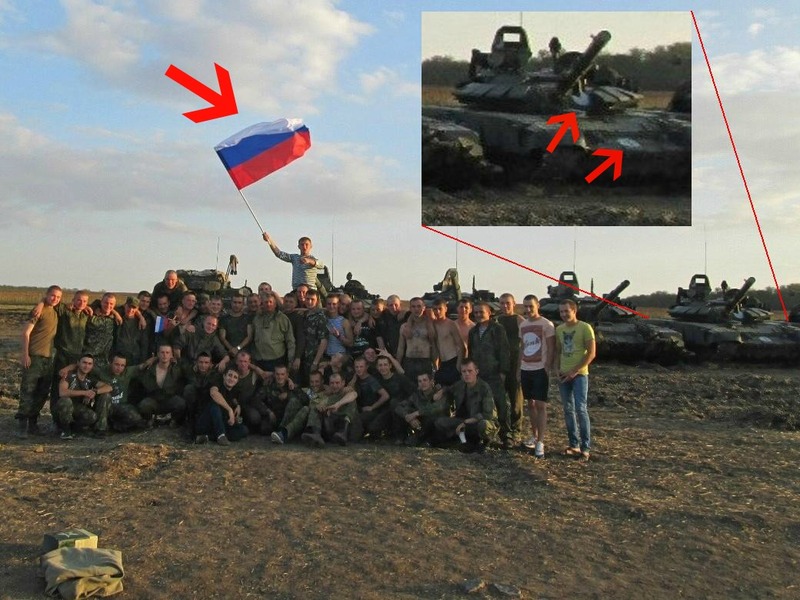 This photo shows a russian tank with people waving a russian flag and the tank has a white dot on it. How much more convincing do you need? If you have some time to waste it may result funny…but you don’t have to take them seriously…otherwise..
19. https://www.youtube.com/watch?v=Ieez6QhywF0 – Западенский хлопец говорит про европейскую свободу слова, пытается высказать собственное мнение, после чего Сашко Билый хватает его за шиворот и утаскивает со сцены. Что было дальше с парнем – неизвестно. 25. http://ars-himmel.livejournal.com/135060.html – Лидер “Правого сектора” Дмитрий Ярош пообещал, что “Россия получит по зубам”, однако через 15 минут дал заднюю и стер публикацию и даже попытался “слепить горбатого” на тему “мы не против русских”. Есть фотка с инверсионным следом, ее везде пихают… Только она на фоне ясного неба, а на видео с падением Боинга все тучами затянуто. 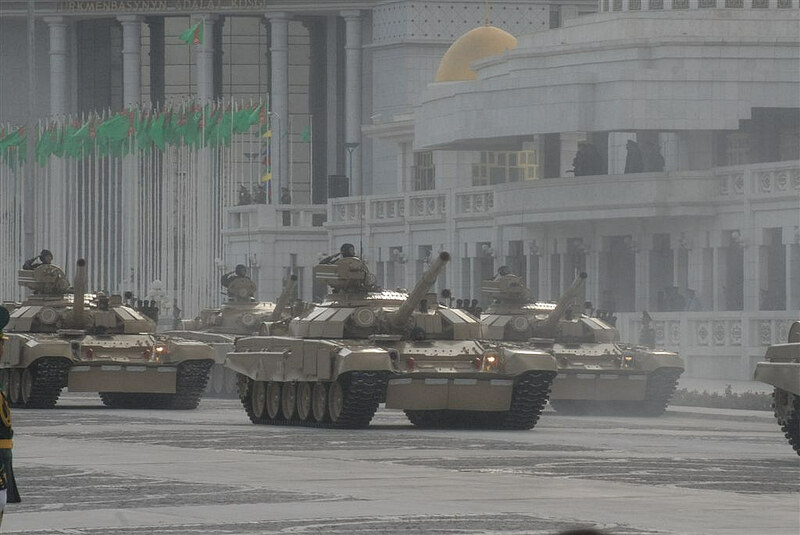 I’m sure those tanks just got lost while on exercise, and accidentally ended up in Ukraine. Oops.